How will you solve a service design challenge which asks us to derive a value proposition for a company whose business logic is fuzzy? One will naturally assume that talking to the representatives of the company, probing them more questions will lead to a lucid understanding of the problem set. But that move proved to be disastrous, failing to produce any meaningful framework for the service design challenge. Interestingly, the answer to this question lies not with the service provider company, not with the service design researcher, not with any other stakeholders but the answer lies right at the center of the customers. Though there are several books that talk about customer-centric innovation, customer driven development and customer oriented business, the revelation or knowledge that comes with empirical study is paramount to one’s service design career. The revelation comes through first-hand experience while working for a case assignment for FORGE service lab. FORGE service lab is a place for creating digital services whose aim is to promote the growth of Internet economy in Finland. It is a joint effort of DIGILE, CSC – IT Center for Science and Kainuun Etu Ltd. As per the DIGILE FORGE Service Lab Video, anyone who has an idea of developing digital service with right skills, expertise and the funds for development can approach FORGE for designing, developing, testing and implementing digital services. Co-creation is the mantra adopted by FORGE to develop services along with experts from several other fields and provides tools like cloud infrastructure. “Enter with an idea and exit with a scalable implementation for commercialization” is their slogan. With these challenges in mind, we – a team of 5, decided to act upon by perusing at length the interview sessions that we conducted with potential customers. I interviewed the CEO of a software company who sells solutions to construction industry. The interview session included key questions that would help us eventually to connect the dots and provide a possible set of value offerings. However, I must confess that though the interview sessions helped us to connect the dots, it still resulted in a blurry image. We listened to each other’s interview session to gain understanding from other possible clients. We also had taken a brief look in using the CoCo tool kit before developing the Service Logic Business Model Canvas. 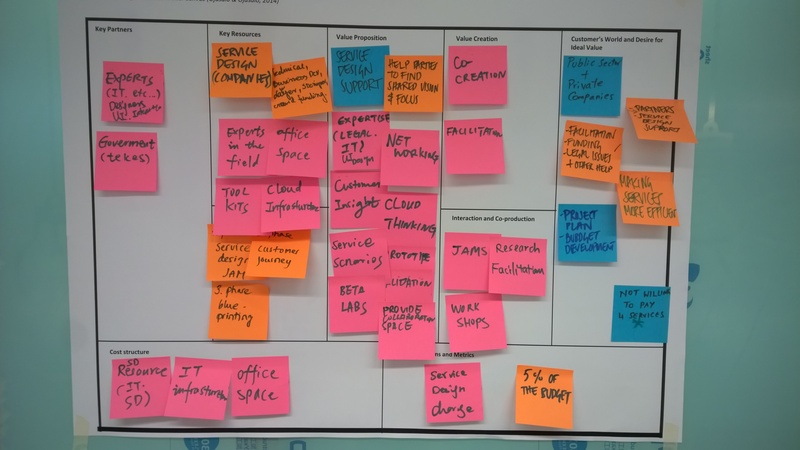 We sat together to map the Service Logic Business Model Canvas based upon the insights of potential customers. For further refinement of the business model canvas, I used the reverse engineering concept to build the service design process for FORGE and the associated value proposition map. During reverse engineering process, I envisioned an imaginary customer who is interested in developing a digital service. I plotted a customer journey map as an example and worked backwards from what the customer would like to have as service offerings and traced back eventually to each of the steps in service design process. 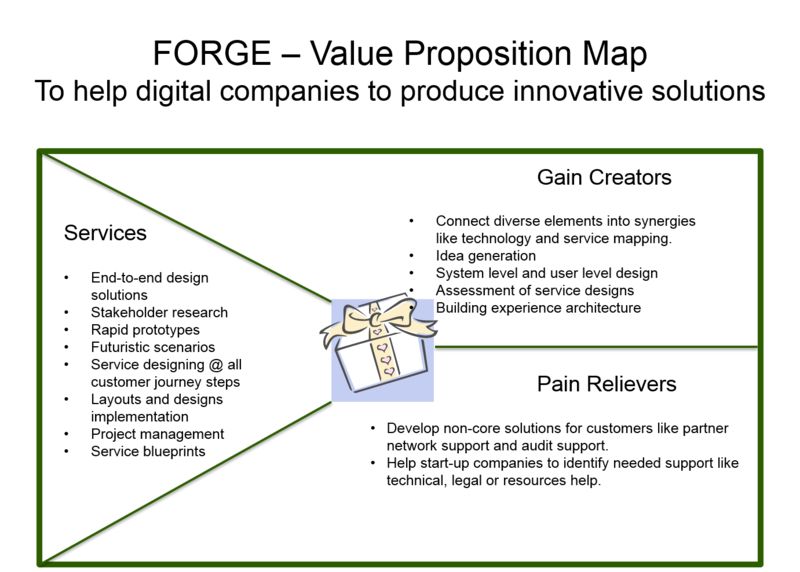 This resulted in the following value proposition map. This significant step has helped us to transform the blurry image into a clear picture. The practical case assignment has helped me immensely to gain thorough knowledge and wisdom of designing, developing and deploying service design process. Cracking the code of a fuzzy business logic has provided enormous confidence in me to tackle any future service design challenges. Ojasalo, K & Ojasalo, J. forthcoming 2014. Adapting Business Model Thinking to Service Logic: An Empirical Study on Developing a Service Design Tool. In Viitanen, J. & von Koskull, C. (eds.) The Nordic School – Alternative Perspectives on Marketing and Service Management. Helsinki, Finland: Publications of Hanken School of Economics. Osterwalder, A., Pigneur, Y., Bernarda, G., Smith, A., 2014. Value Proposition Design – How to Create Products and Services Customers Want. John Wiley and Sons.